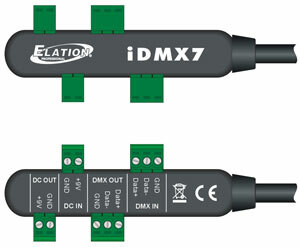 The iDMX7 is a simple DMX controller/playback device that can be controlled via the included infrared remote. It features four work modes which include Auto, Manual, DMX Data Record and DMX Playback Modes. The internal EEPROM is used to memorize current functions and parameters to ensure proper operation. It also includes “BB” technology so programs can seamlessly loop. The iDMX7’s memory can store up to 7 minutes of 512 channels, continually changing channel values. This product is ideal for any application where a simple, discreet, low cost DMX control solution is required.